Wood: Padouk & Pine. Comes with 2 mallets. Size: 120 cm x 40 cm x 45 cm. These Bass-Slit-Drum benches have been used successfully with many different people with amazing results. Some people enjoy the vibration massage, hyperactive children can be calmed with the experience of the deep sound. Acoustically handicapped people can experience sound through vibration and also multiple handicapped persons experience and react to this kind of communication. All slitdrums have an additional pair of feet on the side enabling them to be flipped over 90 degrees. 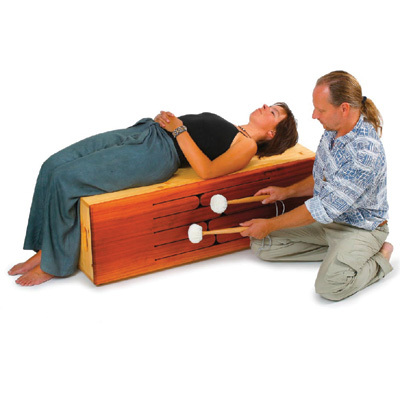 This allows a person to sit or lay down on top, allowing the therapist to play the slitdrum on the side. 8 Tones: A Minor Pentatonic. Wood: Padouk & Pine. Comes with 2 mallets.